The United Arab of Emirates esp read Dubai and Abu Dhabi have embraced high end technology and Western lifestyle to the hilt. That makes Dubai one of the friendliest cosmopolitan cities in the world. When you arrive there, there is not much difference you would notice barring the white clad sheikhs and the bejewelled burqa clad women. Therefore in an attempt to preserve their culture, there is a part of Dubai which still follows the traditional Arabic culture and is called the Bastakiya district. The Dubai creek divides the whole city into two parts before getting drained into the Gulf sea. The downtown Dubai which is the upcale, posh part and the Deira Dubai is its humble brother. The middle class residents, immigrants, etc who are trying to make and save some money reside in Deira Dubai. While the rich natives and high profile expats occupy the downtown. The eminent Burj Khalifa, Dubai mall and all other interesting landmarks are in downtown. Coming back to Bastakiya, this old part of town is very interesting. The houses have typical rods protruding from the walls. Usually they belong to cloth merchants and pearl traders. Today this district has art galleries, boutique hotels and restaurants to acquaint the tourists with the traditional Arabic heritage. 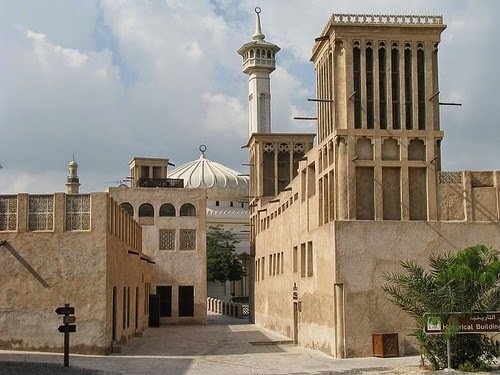 This place is a picturesque step into Dubai's past. Now coming to the downside. Dubai usually has 40 to 45 degree Celsius during most of the months. Since Bastakiya is fully paved, the weather there is 5 to 7 degrees more than the rest of the city. Therefore, as you can perceive, its almost impossible to explore this during the day. At night too, it does not cool down that much. We Indians, so much used to the blazing sun could not survive 5 minutes there. I enthusiastically took two photographs and scurried out as fast as possible!! I remember in one cycle of America's next top model, the models were made to pose in the Bastakiya district in the warmest of winter wear. One of the models fainted and she had to be hospitalised!! I could easily understand why!! The fun part was we crossed the Dubai creek like locals. Yes, by a wooden boat called abra. The water of the creek was calm and serene and we reached downtown Dubai in just 2 dirhams!! I believe that travelling is incomplete unless done with the local people in the local way. I love zooming around in limosines but this kind of experience is priceless!! travelling is incomplete if not done with the locals!! the creek looks so calm and serene... while it was burning hot!! Great trip like the outfit you have on. It looks amazing I would love to go to Dubai! omg...i took the woden boat ride too. it was so much fun. ur dubai posts r reminding me of my dubai trip.